We decided that family was the most important piece of our lives. We wanted our children to be able to look up at mommy and daddy and see college degrees. 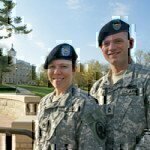 UIU answered for us by providing degree plans that were relevant to both our military careers and civilian aspirations. G.I. Bill; The GI Bill, coupled with tuition assistance, paid 100% of our school expenses including a little extra money to help enjoy the busy life of family, work, and education. The staff was by far the most helpful piece of the experience. There was never an unanswered question as with some schools. Personal communication between staff and students was excellent. We were both able to graduate with honors and get a quality education, not just a piece of paper. Do you believe your military experience has made you a better student? Both of us have applied the discipline of being military learners towards our educations. The ability to time manage and lead has always placed above an even keel with our peers if not much higher. The ability to tackle a task one piece at a time was priceless. Start now! It is more doable than you may believe. Contact UIU as soon as you have five free minutes and let them show you how close you are to a Bachelors degree. The military will most definitely use you, use the benefits you get in a commensurate way.